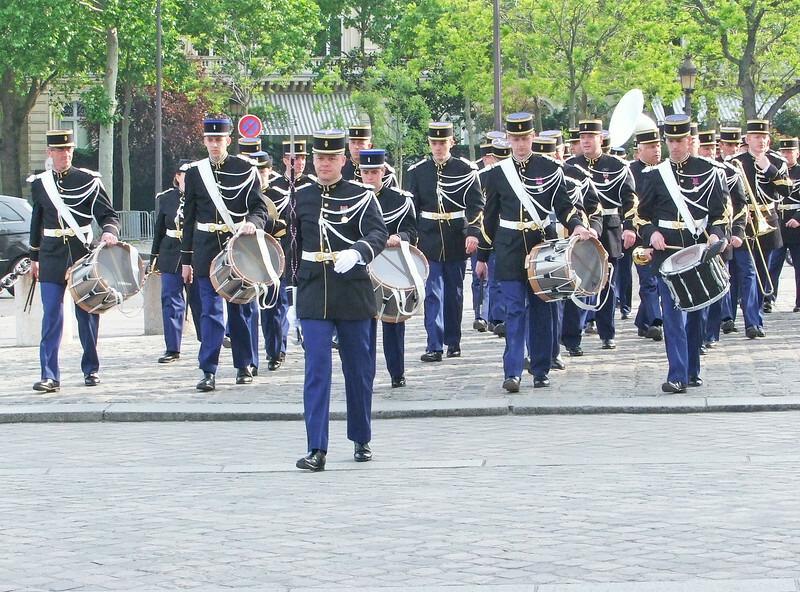 We spent 10 days in Paris and saw two impressive French military ceremonies. The first occurred at the Arc de Triomphe where each evening the French military pay homage to their Unknown Soldiers. Wreaths are laid under the Arch and patriotic music is played. It is a very moving ceremony with many French Veterans participating. A second event was a parade up the Champs-Elysees to the Arc. It was to celebrate the end of World War II in Europe and is called Victoire 1945. We saw the French President go by in his motorcade and also greeting dignitaries at the Arc. The horseback mounted Guard Chasseurs were especially impressive in their striking uniforms and beautiful horses. The band that played at the ceremony.